They host League One leaders Luton Town on Saturday and Fleetwood Town defender Ash Eastham believes they are the team to end the Hatters’ 19-game unbeaten run. 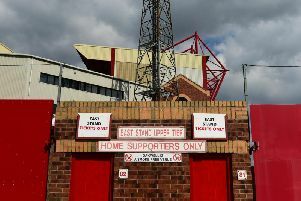 Fleetwood picked up their first back-to-back league wins since October last Saturday, when they built on the 1-0 victory over Charlton by winning at Bradford City by the same score. Those wins have propelled Town back up the table and raised their hopes of catching sixth-placed Doncaster Rovers. And Eastham fancies Town’s chances. The Town captain told BBC Radio Lancashire: “I said after we beat Charlton that we need to get over what seems to be a bit of a hoodoo with back-to-back wins. “The day we do that we will go on a run. We have a tough game on Saturday – Luton are top of the league – but I really fancy us. “The way we are playing at the moment, we are limiting the opposition’s chances on goal, and the lads we have up top and the creative players we have in midfield are giving us a platform to win games. And the 27-year-old says Town’s switch to a 4-3-3 formation was a factor in their recent results. The change of system followed Town’s FA Cup third round defeat by AFC Wimbledon at the start of the year, since when they have lost just once in six games. Eastham, who has had a new defensive partner in on-loan Stoke City youngster Harry Souttar for those last two wins, says the squad are convinced they can mount a late play-off push. He said: “We really believe we can. There is a different feel about our team, the mentality that we have got. “I thoroughly believe that we are playing in a way now that the manager has wanted from day one. “It has taken a bit of time to adjust to his ways but we have looked solid as a team, especially in the last four or five games. “We are limiting the opposition’s chances on goal and that gives you a great foundation to go and get a result.